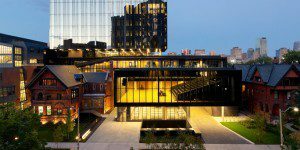 The University of Toronto Executive MBA Program (EMBA) at Rotman School of Management is designed for a select group of working senior management professionals looking to earn a Master of Business Administration degree and advance their leadership competency. The EMBA program is renowned for its academic rigor, and teaches students deep leadership fundamentals, sound decision-making frameworks, and practical management skills. The Omnium Global Executive MBA is a global leadership program that focuses on increasing leadership competency and accelerating global professional performance. This innovative program offers mid-to-senior executives from all over the world the opportunity to travel to international cities on four continents while studying emerging markets. Students live and work in their home countries, and meet together six times over 18 months. The one-year University of Toronto Executive MBA Program incorporates self and team-development planning with strategy, and uses acceleration and applied-learning methods to ensure students are putting their education to practice. Rotman employs a unique residential and cohort learning setting, University of Toronto faculty expertise, engagement and access, and a manageable, condensed schedule for both personal and professional flexibility. The program is structured around four terms, each of which includes a one-week residential module in downtown Toronto. Regular class sessions take place over two days, twice a month, on a Friday and Saturday. The innovative curriculum is based on leadership development, “Integrative Thinking,” and better decision-making. International electives are also available, letting students explore global opportunities for learning at one of the school’s distinguished partner institutions. The University of Toronto Executive MBA has one intake per year. Classes begin in September. University of Toronto Executive MBA classes average 38 years of age, 14 years of work experience and eight years of management experience. Approximately 41 percent of the EMBA class is female and 59 percent male. While class size fluctuates year to year, the program accepts 70 students per year. Omnium Global EMBA classes have nearly identical statistics except only 40 students are accepted with an average age of 36, and 12 years work experience. The cost of tuition for the University of Toronto Executive MBA is $113,775 CAD. This includes tuition, all program materials, class-day meals, accommodations for Toronto residential modules, and customized career coaching. The One-Year EMBA program is considered a full-time MBA program and therefore the tuition fee is partly tax deductible. It also qualifies for the Canada Revenue Agency’s Life Long Learning Plan. There are some scholarships available. Interested students must submit a letter of request for each award they are applying, outlining their candidacy. All awarded candidates are contacted before program start. The Global EMBA costs a total of $107,000 CAD. This includes tuition, meals on class days, and transportation during each module. It does not include travel visas, flights, accommodations, or other personal expenses related to the program. Rotman’s personalized approach assures each applicant a streamlined application process, and ensures that the EMBA of their choice is the right fit for each student’s career and personal goals. Applicants are admitted on a rolling basis, and advised to apply early as space is limited. Applicants should first complete the online pre-application form and attach a current résumé. Next comes a phone discussion with a Program Recruitment Officer within two to three business days about candidacy and qualifications, and an in-person or Skype interview with the Program Director. Once complete, the prospective student should formally apply. The application fee is required, along with a formal application, résumé, two professional reference forms, official transcript (under seal) from each post-secondary institution attended, and employer form confirming type of support granted. A GMAT or GRE score may be required. An English-proficiency score is required from all applicants who have degrees from institutions in which English is not the language of instruction or examination. The admission committee decision is shared within five business days after submission, based on strength of work experience, academic ability to successfully complete a graduate program, management/leadership skills, learning objectives and expectations.